At 9am a group of 5 settlers from the Sussya settlement in the south Hebron hills, accompanied by a uniformed soldier, approached a young shepherd and his sheep. They came with a tractor and trailer and they divided the sheep into two groups and attempted to steal an estimated twenty sheep. The family of the boy saw what was happening and went to help, at this time they were verbally harassed and abused by the settlers. 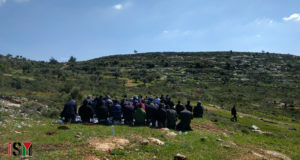 They took photographs, shouted and swore at the Palestinians and internationals before separating from the tractor and trailer and walking back to the settlement and the tractor driving away as the army arrived. 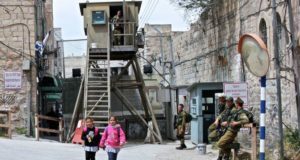 Two jeeps with 8-10 soldiers attended but made no attempt to stop the settlers from walking away despite being clearly visible and not far away. One further vehicle drove past the settlers on the road back to the settlement but did not stop. The soldiers told the Palestinians that the shepherd had taken his animals to the settlement’s vineyard, however this was not true, the shepherd had stayed in the valley (on his land) the entire time. 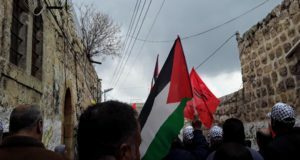 The road was blocked by the soldiers and their jeeps whilst the Palestinians and internationals were ordered to stay 2 metres away from the roadside. A local farmer phoned for the police and the young shepherd was taken to a police station whilst the two internationals were told they were under arrest and also taken to the same police station.